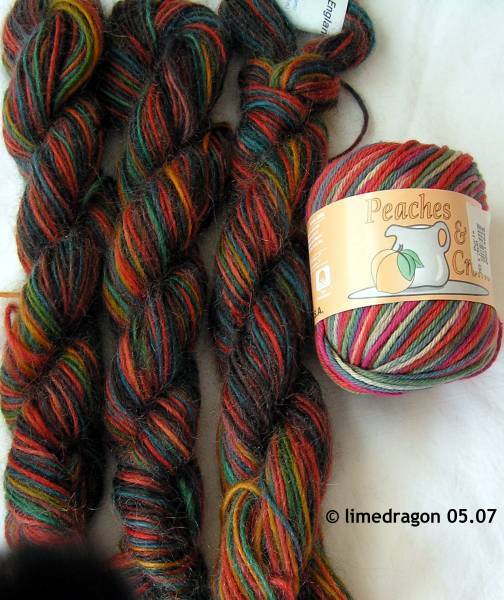 The 3 skeins on the left are Brown Sheep Handpaint Originals, and the cotton is Peaches and Creme in Painted Desert. Maybe I should knit an Arizona washcloth? Interestingly, the Brown Sheep colorway is named “New England Fall” which I find amusing. These oranges, browns, and greens seem more Southwest than New England to me. 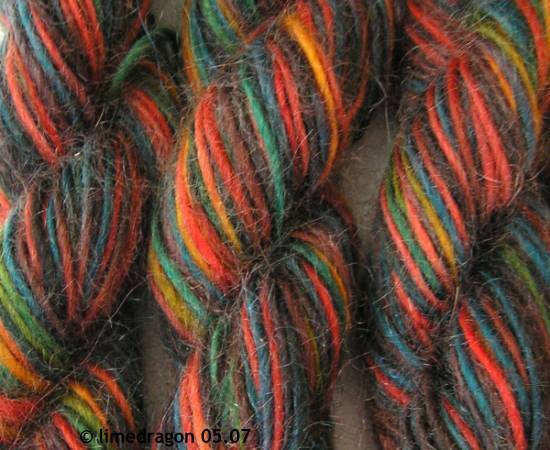 Perhaps I’m influenced by the rustic appearance of the yarn (70% mohair)�it reminds me of Navajo rugs. Thanks, Mom; these will be perfect for mittens. Coming tomorrow, a sock post! That’s the kind of yarn I like to rub on my nose before I buy it. I love the soft appearance. I guess I see some New England fall in there. I do think the blue throws it off a bit! Um yeah, that’s not New England colors at all. Definitely south west influence. Someone’s confused…but very pretty! That yarn doesn’t make me think of New England at all. Not even in the fall. Like Kelly, the blue really throws me off and makes me think of something more Southwest. It’s beautiful nonetheless! Huh. I’d think of all brown dust shades with a spot of dingy green now and again (for the southwest, I mean). Now, the sunsets are beautiful – but those aren’t the right colors for that either. Great colors, though! And I’m going to go check out Purls East now – never been there (what’s wrong with me?! ).